Update: MyBlog theme works fully with WordPress 4.6 and is still very much supported. If you’re looking for something better, you may want to check out The Essence, created by our friends over at MeridianThemes. Version 1.2 is out now! 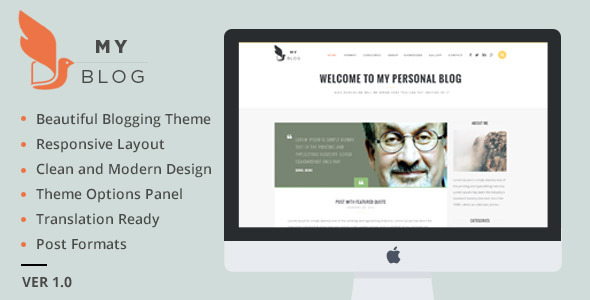 My Blog is a fully responsive, clean, and modern WordPress blogging theme. Featuring two blog layouts, numerous sidebar & footer widgets, featured posts area, post formats, and more. 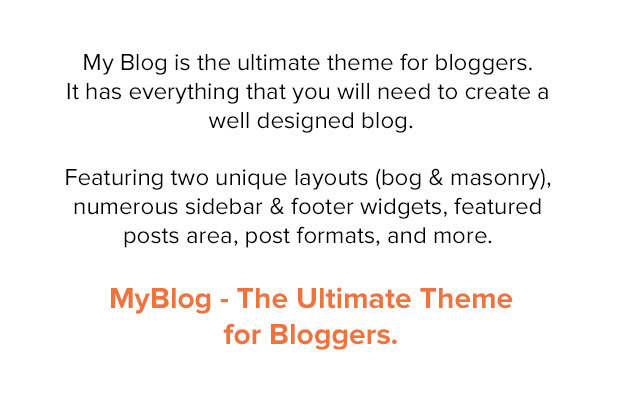 My Blog is the ultimate theme for bloggers. It has everything that you will need to create a well designed blog. Thanks to HTML5 & CSS5, WordPress Live customizer, and custom widgets, building your blog has never been easier. It also has a beautiful featured posts area or slider to showcase your best content.